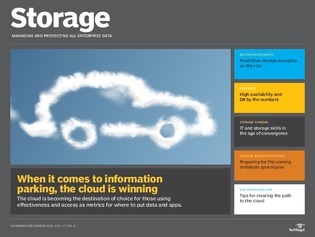 Our November issue of Storage magazine examines why information storage on the cloud is becoming many organizations' top choice. Our infographic looks at how businesses are handling high availability and disaster recovery, and another feature discusses how storage specialists can stay relevant as storage management simplifies. And in a number of columns, we discuss how cognitive data management may help with the coming data deluge and how IT department leadership can assist with public cloud workload success.